plugmidiin delivers any MIDI information targeted to the plug-in. It functions analogously to the Max midiin object, delivering raw MIDI as a sequential byte stream. You'll want to connect the midiparse object to its outlet. 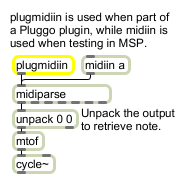 MIDI information is always delivered by plugmidiin at high-priority (interrupt) level. You may have more than one plugmidiin object in a patcher; each will output the same information. (MIDI): MIDI message bytes in sequential order. For instance, a note-on message on channel 1 for note number 60 with velocity of 64 would be output as 144 followed by 60 followed by 64.